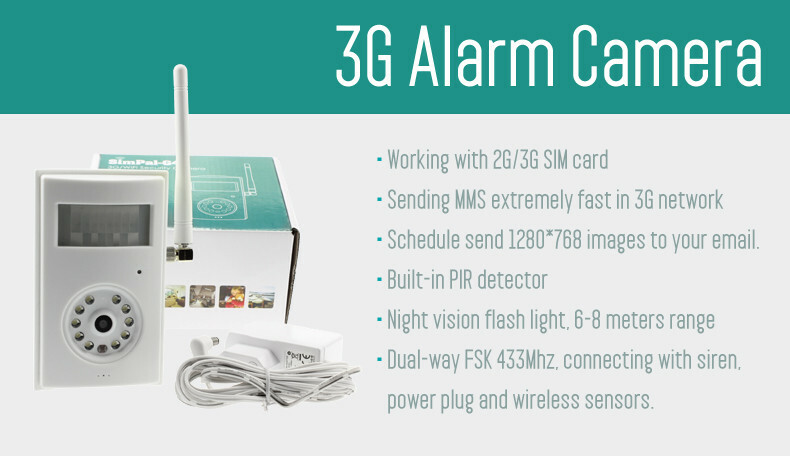 iAlert 3G alarm camera, one of the simple image capturing devices, integrated security alarm PIR detection technology and telecom 2G/3G mobile network technology. With built-in PIR sensor, 5M pixels camera lens and 3G WCDMA module, once camera detection motion, it will capturing images and sending out the images by MMS or email via Cellular network; it will also sending SMS, make calling to notify user. Support SIM/Usim card, sending SMS, imges to email once detect motion. 5.0M camera lens, built-in PIR detector Wireless video camera, wireless alarm camera, 3 G camera. Perfect selection for home, office, shop or warehouse security, especially for place without WIFI, such as summer house, private village, boat etc. SMS, MMS or email alarm: Use GSM/3G SIM card, auto send SMS, MMS or images to email by GPRS. PIR detection: Built-in PIR detector, auto alarm once it detect human motion. 1280*768 HD images and send to email via Cellular network. Real time audio: call the camera number (SIM card) to listen in live voice. Configure the camera remtoely: Control and configure the camera with short messages (SMS) commands from a mobile phone. Night visiont: 10pcs LED will help camera take clear images at dark environment. Built-in lithium battery: Rechargeable battery ensures operation if any external power failures. Camera come with built-in PIR detector, detect human motion and send pictures to e-mail by GPRS or WiFi. Set camera auto send pictures to e-mail according your schedule, can be use to obsever your objects. Connect up to 16pcs wireless sensor, such as wireless door magnetic, wireless PIR detector, wireless smoke detector etc, works as brain of full-set home alarm system. Camera support GSM 2G, WCDMA 3G and WiFi network, can be receive alarm by SMS, voice calling and picture e-mail. 1200mAh backup battery make the camera working 8-10 hours even external power supply cut off. SMS notification of power supply change. SimPal-G4 extremely easy installing, remove battery cover, install SIM card and connect the power adaptor, then its available working for you. IOS and Android application available now, easy control the camera in your smartphone.